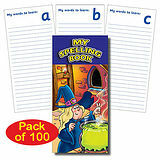 These great magic-themed 'My Spelling Book' dictionaries are brilliant for pupils to keep a log of words they need to practice spelling. Each book has a laminated cover and 28 internal pages including a "This book belongs to" page, and a page for each letter of the alphabet for pupils to write words/definitions. 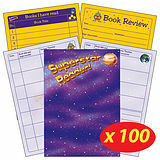 Save £6.06 (£5.05 ex VAT) when you buy this pack instead of individual record books. Click to view quantities under 100.